Talking to the internet is like talking to an old guy with Alzheimer symptoms. You have to know where you’re going, and say the same thing over and over. If you get bored of it, the old guy gets mad at you for being rude to him. If you give up, the internet will forget you existed at all. And then you die, and you’re forgotten anyway. So, basically, what I’m saying to you, dear reader, is: If you want to know what I think, read through the archives. No, there isn’t anything new in there. But you’re not going to find out the latest news on this blog anyhow. There are quite a few things I want to say again, but I’m not saying them twice. We’ve worked hard to keep this blog insightful and meaningful. If you’re looking for entertainment, perhaps best to look elsewhere. 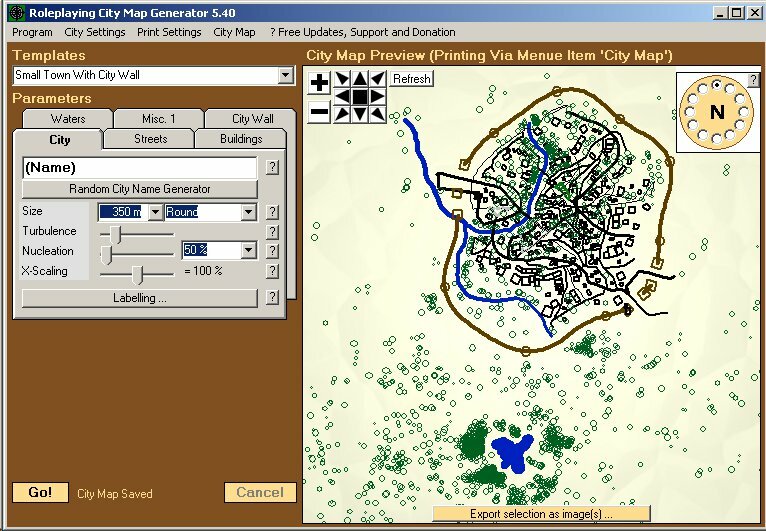 So you may have seen an old program kicking around called “Roleplaying City Map Generator 5.4” which is pretty useful for making city maps. There are a few problems with it, like you can’t edit the map once it’s been generated, but it works well for what it does. There’s an importer into the excellent “NBOS fractal mapper” that can be found here.